So far in the reviews of recent Bionicles we've been looking at the regular Toa and Makuta warriors, and their Matoran sidekicks/cannon fodder. But there's a third kind of Bionicle, the Titans, and like the same suggests, they're not titchy. 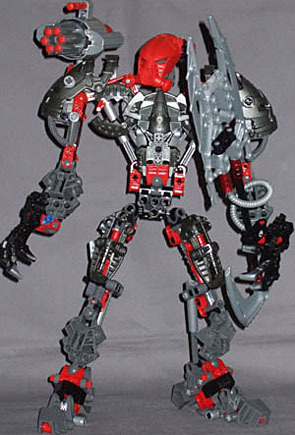 Once just a guardian robot, Maxilos has been taken over by an evil intelligence determined to destroy the Toa Mahri. Aided by his energy hound, Spinax, Maxilos uses his twin-bladed black fire sword and shoulder-mounted Cordak revolving blaster to seize control of the Pit. There's a first (for me, anyway) - this guy's really a robot, not a living breathing Bionicle who just happens to look like a robot. You can tell the difference in... actually, I can't. Maybe he's an android. He's definitely pure robot though, not just because the bio says so, but because he's done what all robots really want to do, which is turn on their creators. No Asimov Laws in Mahri Nui, then. As any student of classical mythology will tell you (not that you needed to know, but people who choose such esoteric university degrees generally have to convince themselves it was worthwhile by spouting trivia at every opportunity), the titans were rather large, and Maxilos lives up to the name, standing 11½" tall to the top of his head - an even foot if you include the Predator-style shoulder cannon's extra height. He does manage to look genuinely robotic, too, with his bright red skeletal components overlaid by a whole lot of silver and gunmetal grey - maybe it was just luck of the draw, but his colour palette and distribution strikes me as less naturalistic than usual. 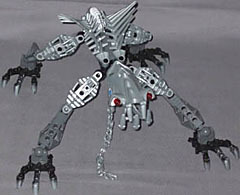 By my count Maxilos alone is around 200 pieces (maybe a couple under that), so they didn't get that extra size just by making the usual Bionicle bits larger. The arms and hips are more or less normal - give or take the unusually elaborate shoulder armour - and of course the head is the usual Bionicle head, but everything else is heavily modified and augmented from the standard Toa body plan. The feet alone are 14 parts each, basically made from two standard feet each, one as the toes, the other tilted over to form the heel, with a lot of connecting stuff in between. The lower legs come in two pieces, a standard shin segment in front, and a balljoint-mounted pressure piston in back, connected to the thigh, to increase the stability of the knee and ankle joints. The thighs are completely made from small parts, with lots of armour bolted on to bulk them out. It's the torso where things get properly intricate though - the legs would satisfy a Technic builder, but the body will have them properly enjoying themselves. It's kind of difficult to break Maxilos down in the usual articulation sense - he's got a waist balljoint, but as well as connecting via that to the chest, the hips are joined to the shoulders by two more pressure pistons. The shoulders are themselves mobile on balljoints connecting back to the chest, as well as balljoints at the other end for the arms to attach to. It takes a bit of practise to really get the hang of posing Maxilos's torso - he's very flexible, but it's all interconnected, and you have to become accustomed to the effect the joints have on each other, with swivelling the waist making the shoulders rotate, tilting the torso changing the angle of his arms to his body... it's all very complex, and ironically more organic-looking than most of the "living" Bionicles. To round out the articulation, his head is mounted on a beam with a balljoint at each end, which lets him crane his neck around all over the place - very useful for "body language" adjustments, since the orientation of the head is such a large part of that (particularly with a masked face). His Cordak blaster is mounted on a balljoint fixed behind the right shoulders - it's the same as the ones used by the Toa Mahri, with a total of nine darts provided in the set, six for the rotary barrels and three spare; I used one of the spares as a targeter kind of thing, which makes the Cordak's dorsal Technic port look more useful. Unfortunately, Lego didn't quite get the body design right. Maybe it was just an oversight with this figure, maybe it was that Lego's designers weren't yet that experienced with this level of complexity in Bionicle bodies - I know there were earlier larger-than-usual figures, but from what I can see in photos they look more structurally rigid than this one - but the hips are a big, big weak point. Maxilos is much heavier than your ordinary Bionicle, and although the hip balljoints are contained in special housings, which add a purpose-inserted rubber casing to the usual balljoint mount, it's not quite enough. Put this guy in a wide, action-y stance, on a moderately smooth surface, and his own body weight will just make his feet slide out from underneath him, leaving him doing the robot splits. The closer together his feet are, the more stable he becomes - and he can be posed in wide stances, since the augmented joint housings are nearly good enough, but it takes a lot more care than a Bionicle really should just to hold a pose. Besides his Predator gun, Maxilos has his "twin-bladed black fire sword," whatever the heck that's supposed to be - it looks like a spear with a slim dual-barrel flamethrower built into it, but what use that'd be underwater who can say? Maybe "black fire" works in water. 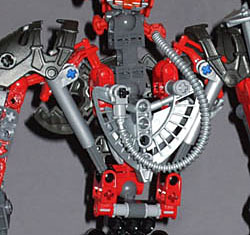 Maxilos's hands are regular Bionicle claws with no gripping ability, so the spear/sword/whatever gets fixed more or less in his grip by a plug just above the wrist. The other hand, in the corresponding location, has a free plug to attach a leash to, which brings us to biomechanoid android's best friend, Spinax. They let robots keep pets in Mahri Nui, that's nice of them. Spinax is much simpler than his handler, and in fact is more or less a Barraki in terms of his body plan - standard arms and legs (all ending in feet, in this case) mounted on a spine built from small parts rather than a standard Toa torso. The back is very clever, though - there's a central spine and tail piece, which is actually just a sword mounted horizontally, and starting on either side of that and continuing forwards to the shoulders are a pair of flexible spiked spines. The clever bit is that they twist 90°, and being soft plastic, the twist is nice and even along their length - the two rows of spikes, starting vertical and slowly spreading out to either side of the tail, look genuinely organic. Articulation is pretty much what you'd expect by looking at it - balljoint neck, pin joint to allow the jaw to open and close, and balljoint hips, knees and ankles on all four legs. 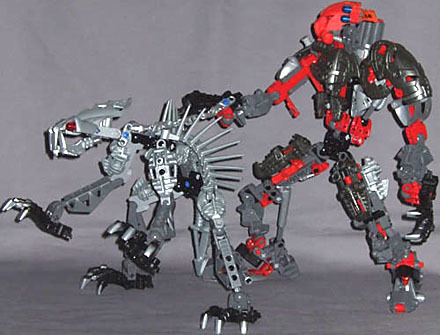 Even with the weak hips, Maxilos is simply bloody impressive - he towers over regular Bionicles, and given a little patient adjustment so he stays upright, can be positioned in dramatic stances that even the heavily balljointed Toa-sized figures can only dream about.